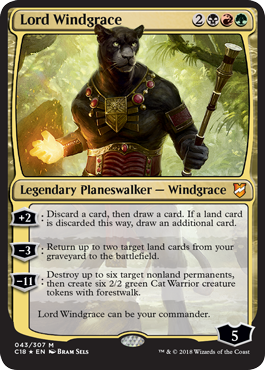 Lord Windgrace is another character I really didn’t expect to ever see on a Magic card. Not because he’s not important – he actually is, as the leader of Urborg’s anthropomorphic panther people, the guardian of that island more generally, one of Urza’s Nine Titans who took the fight to Phyrexia during the Invasion block, and a planeswalker who played a major role in the Mending during the Time Spiral block. In that block, he seemingly died in physical form, but his essence pervaded Urborg such that he may have remained metaphysically alive. Without having read the documentation for the Commander 2018 decks, it’s not clear whether or not this depiction of him is pre-Mending, but considering that he may not ever have been truly dead, it’s not out of the question that he has in fact returned. Windgrace raised a few eyebrows because he didn’t interact as strongly – as linearly, you might say – with lands as the headliner of a broadly land-themed Commander deck might. That actually kind of helps his prospects in a way. Even if his +2 doesn’t let you net one card drawn on a regular basis, it can certainly set up reanimation strategies, or things like Lhurgoyf and Lord of Extinction. I do like his -3 ability and it is clearly intended to synergize with his +2, and it can even be a pseudo-ramp effect with the right setup; that is a little more difficult than it sounds, but it’s an option under the right circumstances. His ultimate is of game-ending power level, but at -11 it’s tough to reach; even in Commander, people will probably try and stop him long before that, to prevent you digging further into your deck if nothing else. It’s worth noting that it stops anything up to and including rival planeswalkers, of course. Now, can we get Bo Levar, Commodore Guff, and/or Kristina of the Woods in Commander 2019? Now here’s a blast from Magic‘s storied past: Lord Windgrace, one of the nine Titans and part of the Weatherlight story arc, referenced on cards in older sets but without a card of his own. Until now. He’s the flagship card on the Jund-colored “lands matter” deck; while the deck’s execution of the theme is maybe a bit dubious, the black kitty cat at least furthers the theme. His +2 is conditional card advantage, and it pairs well with his -3: discard lands to draw more cards, because you’re getting them back anyways. On its own, this is an effective, albeit slow, value engine, and having this at your disposal makes utility lands (like Wasteland and Ghost Quarter) more effective. So it’s a pretty powerful piece on its own. As for Windgrace’s ult…going off at 11 is a bit of a tall ask, four turns after he drops, but it can be a doozy. Blowing up six things across all boards is very nice, and you get an army of Cats out of it. Cats that are quite good against opposing green decks; this is actually the first time since landwalk was discontinued (after Magic 2015) that we had a new card with a landwalk ability referenced, which is a nice bit of trivia. Very powerful against opposing green decks, but the fact that you have six 2/2 creatures is nice against most decks. Lord Windgrace isn’t the flashiest planeswalker, but he is powerful enough in a deck where his talents are allowed to shine. He’s unlikely to make a splash in Legacy, I feel, but Commander is a fine home for him.